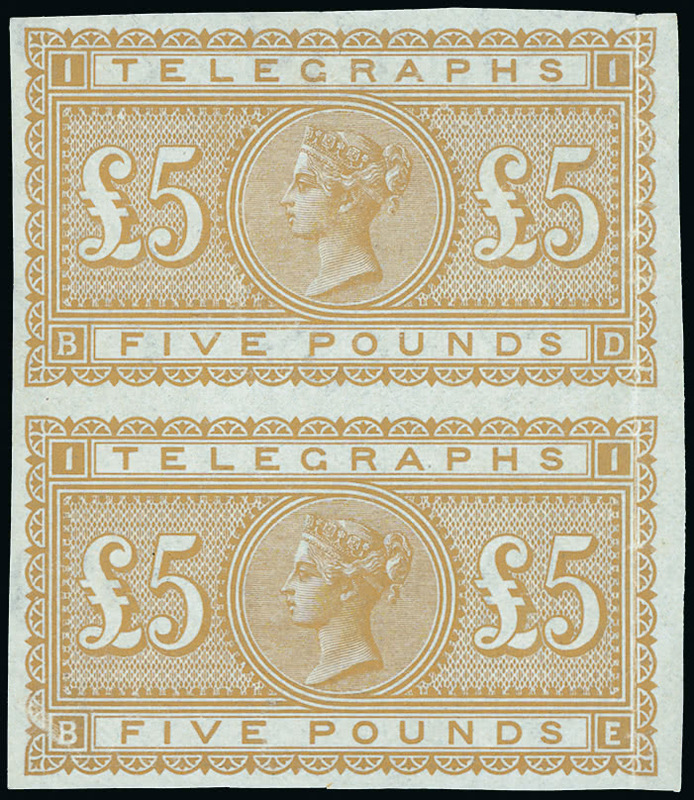 Featured on the front cover of the auction catalogue, a beautiful colour trial pair for the Queen Victoria Telegraphs £5, printed in gold (lot 227, left) realised an impressive £4,165. 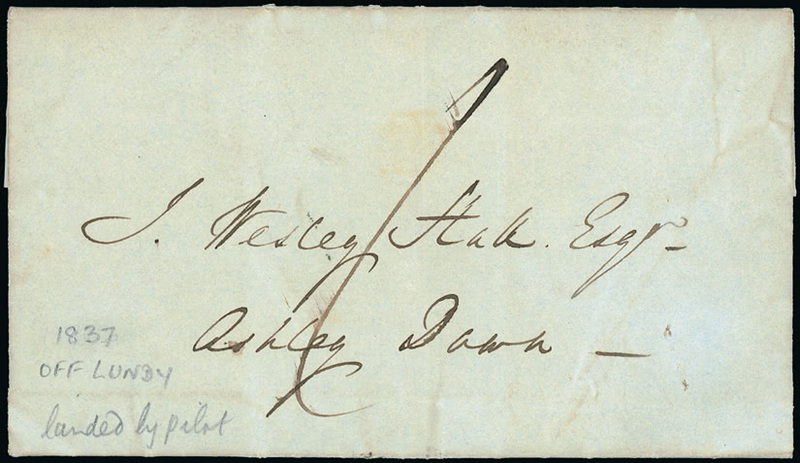 There was a strong response also to the exceptional ‘Bristol’ collection of Lundy, top price on the day being the £2,856 paid for a rare early letter (lot 1083) written in 1837 on board ship “Off Lundy”. Other notable prices included £11,666 paid for a marginal set of ‘BPMA’ imprimaturs of the 1915 De La Rue Seahorses (lot 812) and £9,210 for the handsome 5s. 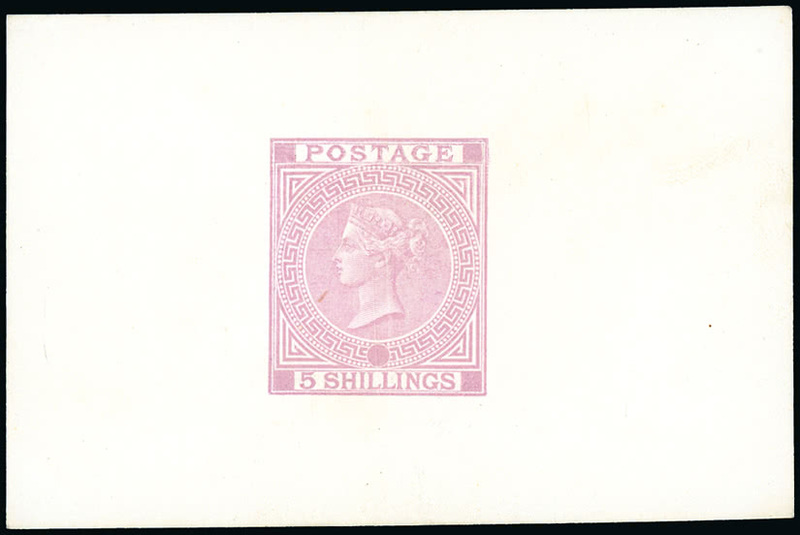 die proof in mauve (lot 678), produced by DLR for the 1870 International Exhibition and one or just two examples that exist in each colour in private hands. The 26th/27th April British Empire & Foreign Countries auction provided a broad spectrum of material and brought to the market the first part of the remarkable Stefan Heijtz, FRPSL, International Large Gold Medal winning collection of the postal history of Saint Helena. 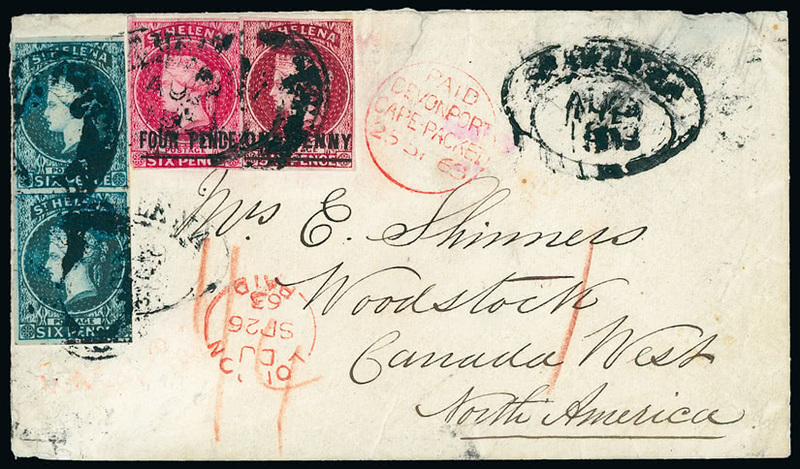 Just two covers bearing the first imperforate issues of the colony are known so it was unsurprising that the finer of these (lot 2716, left) attracted great interest as well as a strong £11,052 realisation. After his sad death in 2016, the late Donald Napier’s collections of Jamaica postal history and British Africa Airmails, together with the balance of his noted collection of Rhodesia, were presented in 318 lots. 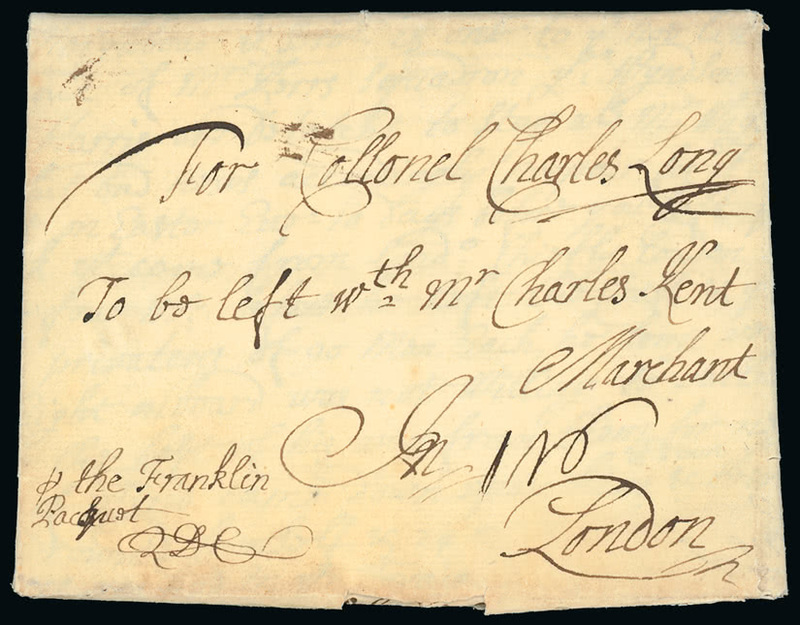 Amongst these a 1707 entire to London from the Chief Justice of Jamaica, a scarce item from the Dummer Packet Service (lot 2219) rose to £4,760 whilst the rare 1926 Cobham & Elliot Rhodesia to London flight cover (lot 1589), signed by all three crew members, reached £2,026. However, in this auction it was the section of Egypt, which included a number of unusual imperforate specimens from the so-called ‘Royal’ printings, which drew the most competitive bidding at this sale. A single example of the 1938 King Farouk’s Eighteenth Birthday £E1 (lot 1957, estimate £1,500-£1,700) was seen to rise spectacularly to £8,092.